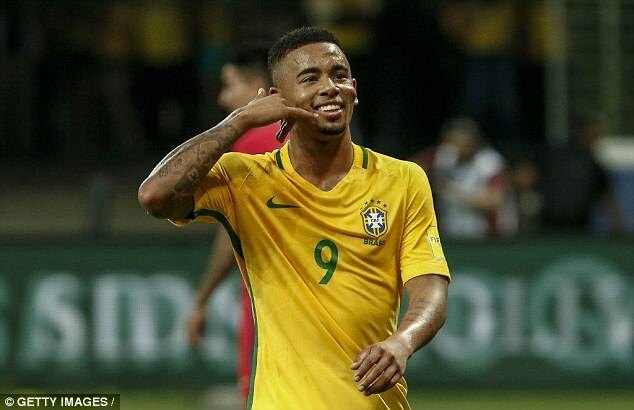 Gabriel Jesus embarked as the new Ronaldo of Brazil team. Dani Alves impressed of Jesus performance who played outstanding for club and national both side. To see the mind blowing the Brazilian right back compared Jesus with the Brazil legend Ronaldo. Brazil had played against England at Wembley in London on Tuesday night. On the eve of the friendly match Alves praised Jesus in front of the press conference. And Gabriel played really well but the luck did not clench them and unfortunately they unable to make score. Finally the match ended with draw. On Friday, Jesus scored the eighth goal of international football in a 3-1 victory over Japan. It is fairly clear in his excellent series of performance that the 20-year-old forward is going to be one of the keys to Brazil’s success in the 2018 World Cup. Not only that the Manchester Premier League forward has scored seven goals so far this season in the English Premier League. Because of such a great performance Alves sees Ronaldo’s shadow in him. The youngstar really damn good on his game. He considering all qualities how to deal with the ball. He has also a good knowledge about the opposition. Alves, who goes to lead the team against England, strongly believes that this comparison will not have any adverse effects on Jesus. The Brazilian right back told that he did not joke any more when he called him new Ronaldo. He really feel that ad so that he called him Ronaldo. According to his version the desire of the both footballer being same and the Man City player is a great player and a better player. Alves also added that What he has actually think and actually done. whatever he has earned, there is no pressure. He is doing what he loves. That become the character of real hero. The Brazilian Coach Tite agreed with Alves and he also praise of Jesus. The joining coach who wanted to reach the team performance very high told the team needs such a kind of player who have the quality what considering the Man City forward. The boss also added that an athlete from this stage can only be blamed with the team, and there they so hopeful. Only his hope and the high ambition going to back the team their past honorable position, which almost lost in the previous few years. A long time later the team again started to dream of success.